I’ve been reading James MacGregor Burns’ book Fire and Light: How the Enlightenment Transformed Our World. It’s a fantastic book, one I’d recommend to anyone with even a passing interest in world history, politics, or modern philosophy. Really, it should probably be mandatory reading for anyone interested in U.S. history, especially the period of political tumult and intellectual fervor that characterized the nation’s nascence. 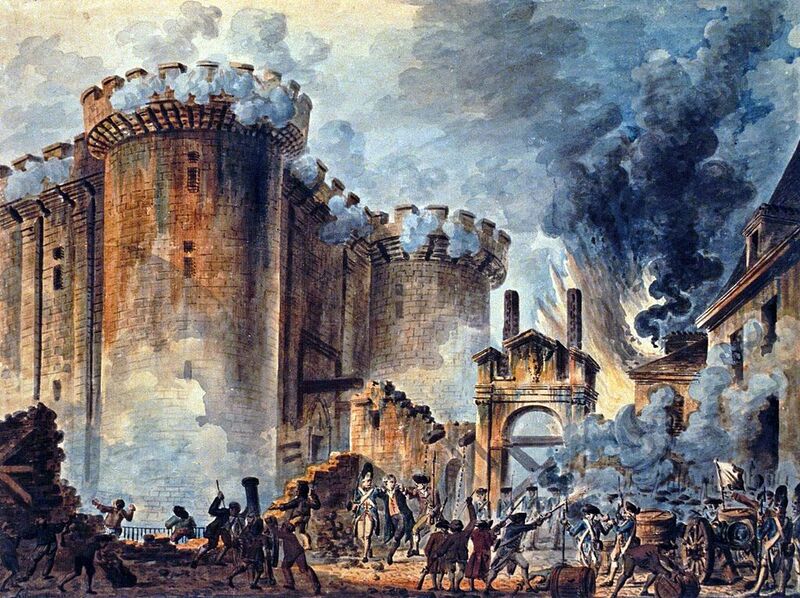 Last night, in reading a chapter on the British response to the (seemingly) dumbfounding success of the American Revolution and the unease sparked by the developing Terror across the channel in revolutionary France, a largely tangential thought occurred to me. Or, more accurately, recurred to me, because it’s an old question: why do certain historical events, separated by sprawling chasms of space and time, bear such striking resemblance to one another? That causal theories of history tread hazardous ground is widely recognized, but speculation concerning why history is populated with remarkably similar events provides fodder for some entertaining intellectual masturbation. In precisely that spirit, I’ve decided to spill some energy bouncing a very simple idea across the digital aether: certain historical events look, if not like twins, then like distant cousins, because they are product of the simple fact that humans tend to do similar things in similar circumstances. That is, that the behavioral repertoire of humans is sufficiently circumscribed that certain responses to vaguely similar triggering events are bound to recur on a long enough time frame. History does not repeat itself – at least not in any literal or precise sense. Nevertheless, the parallels between events culminated from disparate causes and separated by decades, centuries, or millennia of intervening history are sometimes striking enough that one can be forgiven for thinking otherwise. What these similarities reveal is not the mechanistic internal workings of human affairs, but what might be referred to as the conditional regularity of human behavior. Similar circumstances unsurprisingly engender similar responses. Consider, for purposes of illustration, the repeated instances of governments wielding the looming specter of external events to justify the suppression of internal dissidents. In the late 18th century, the ruling parties of Britain used the anxieties provoked by the French revolutionary Terror to silence opponents, curtailing subversive speech and prohibiting large public meetings. Revolutionary or critical voices as were denounced as “Jacobins”. 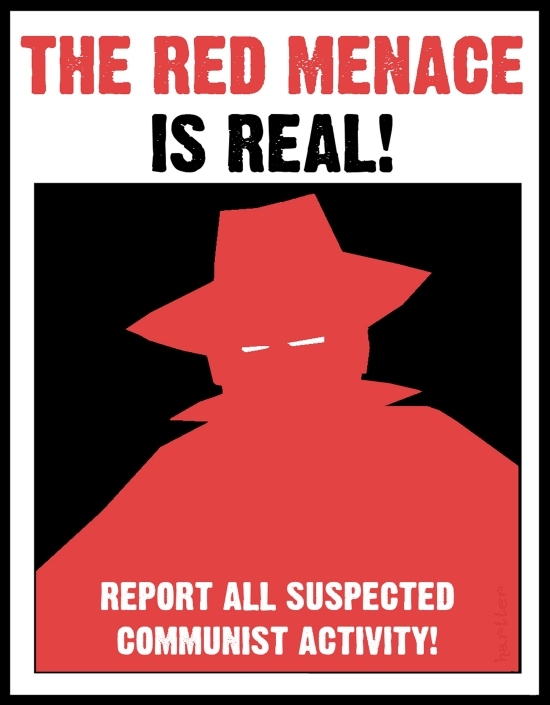 In the middle 20th century, American conservatives – under the leadership of the reprehensible would-be autocrat Joseph McCarthy – likewise invoked the threat of communism to justify their campaign to seek out and harass potential political opponents. More recently, U.S. congressmen across the political spectrum invoked the threat of terrorism – primarily of the Islamic, or “foreign”, variety – to legitimize efforts to roll back constitutionally enshrined rights to speech and privacy, exculpating themselves from sins against the very essence of American democracy on the grounds that such actions guard against greater threats to life and property. 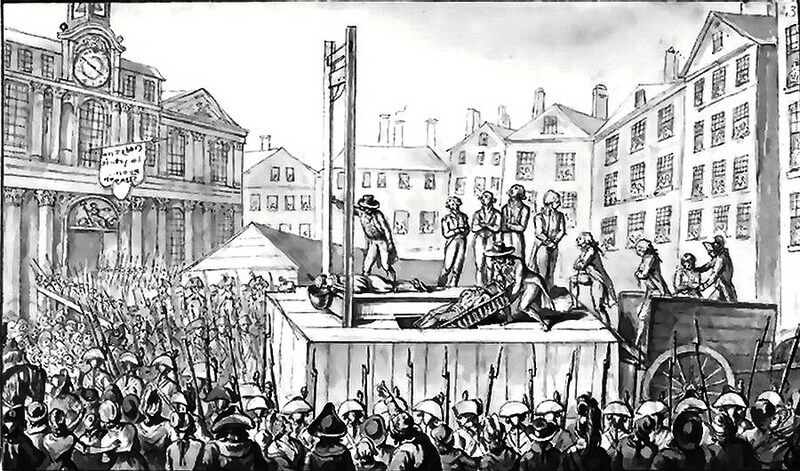 Sketch of executions during the Reign of Terror. One school of thought holds that these events result from the intrinsically exploitative and nefarious nature of authority, that there are only so many ways leaders can exploit external threats and public fear to further hidden agendas. This may be true in a limited sense – there are undoubtedly leaders who harness and abuse public sentiment to satisfy veiled motives. Indeed, it is very difficult to explain the second Iraq war (2003-2011) without invoking precisely this type of reasoning. But the more general truth underlying the regularities apparent in distinct historical events relates to something more rudimentary. What the aforementioned explanation gets right is that these events are not produced by the ceaseless revolutions of the cogs of history. Any impression that history is somehow cyclical is purely illusory. On a deeper level – though certainly less satisfying to one’s internal, oft irrepressible conspiracy theorist – the apparent repetitiousness of history is simply a byproduct of the fact that all history is the product of the behavior of the same animal. More precisely, history is the product of interactions – on a variety of scales – carried out among a species of highly gregarious primates, variously inclined toward cooperation and conflict, and uniquely capable of transmitting large stores of extra-genetic information across generations via language. The British response to the French Revolution, communist witch hunts during the Red Scare of the 1950s, the Patriot Act and domestic spying – these events illustrate a more basic human tendency to get whipped up into a panic of frenzied ignorance and overreact to distant threats. Or, more precisely, to overreact to the imaginary bridges we construct between distant threats and our own best interests. One need invoke no conspiracy to uncover the connective tissue between these examples. All that is required is the recognition that some humans, gifted with a particularly sharp eye for downstream threats (both real and imagined), are hawkish, eager to protect the status quo, and preserve traditional ways of life. This behavior is certainly self-interested, and to that extent it lines up with the instincts of the conspiracy theorist. But, cynical as it seems, very little human behavior can’t be reduced to self-interest on some level. The larger point is that some folks are imbued with certain inclinations. In these examples, men and women inclined toward reactionary defenses of the way things have always been left their mark on history. Of course, the particular causes of any historical event are highly contingent. The specific roots of the British response to the French Terror and McCarthy era communist witch hunts are entirely distinct. They represent individual manifestations of basic human tendencies triggered by unique and disparate events. In this view, it makes little sense to explain the British response to the terror, communist witch hunts, or trembling despotic impulses behind the Patriot Act and “War on Terror” by pointing to human nature. Surely these things are the product of human nature, but a comprehensive understanding of any of them won’t be achieved through this kind of reductionism. However, there is insight to be gained from studying their commonalities. Here, the answer is deceptively simple. One need invoke no cosmic force, driving human affairs to endlessly perpetuate the same trends. More elegantly, one need only look to the relatively unremarkable fact that all history is the product of the behavior of one species of primate. We like to flatter ourselves with illusions of infinite plasticity, most recently rooted in the Lockean fable of the blank slate. Yet a wealth of evidence suggests that, despite the massive, perpetually expanding body of cumulative cultural information that makes modernity look so distinct from antiquity, the habits of instinct are difficult to escape. History doesn’t repeat itself. But given the right circumstances, humans often do.